Watch out Kate Middleton, you now have a royal style rival! Dutch Princess Maxima became Queen of the Netherlands on Tuesday during her husband, King Willem-Alexander's inauguration. 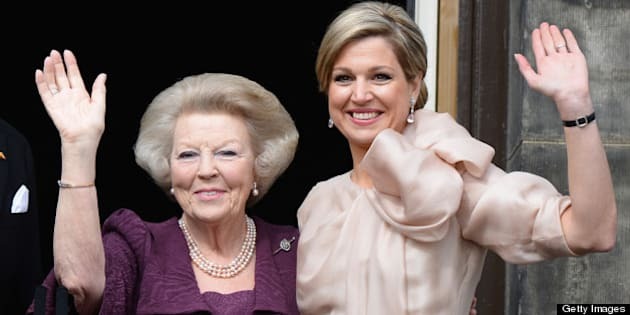 Former Queen Beatrix abdicated the throne after 33 years as ruling monarch which cleared the way for her 46-year-old son, who is the first Dutch male monarch in more than a century. For her big day, Maxima wore a satin champagne and rose-coloured outfit with a large bow on her shoulder, a sequined skirt and a diamond pendant on a sash around her waist. Hey, one can't be queen without a little bling, right? The 41-year-old wore her blond hair in a chic updo with a low bun and swept bangs, which revealed her diamond drop earrings. But Queen Maxima isn't just a pretty face. The Dutch royal studied economics before she met her Prince and worked for Deutsche Bank in New York. Maxima also worked as the UN Secretary-General's special advocate for inclusive finance. This Queen's got brains! We can't wait to keep tabs on this blond beauty's style.